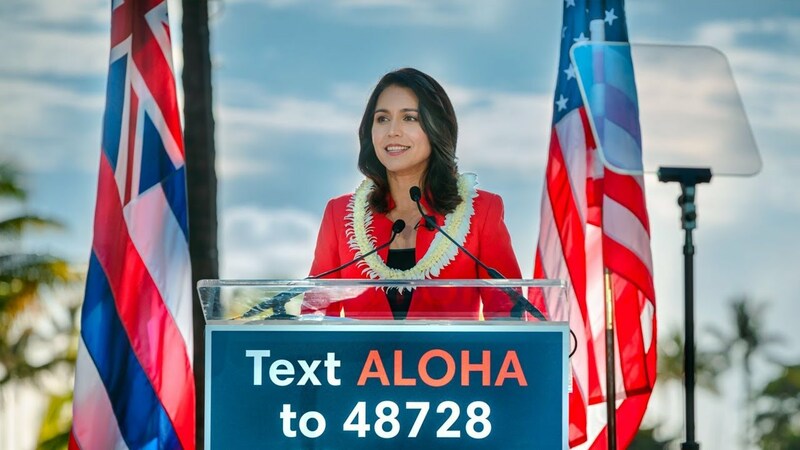 She has it all folks, Tulsi Gabbard might be our Next POTUS. This very well may be the Democrat to be elected POTUS in 2020. Gabbard has some very, very pro American viewpoints. "Breaking up big banks?" What's that about? Another wealth redistribution scheme? "Sustainable agriculture?" What's her plan there? Otherwise that's just empty rhetoric. A "renewable and sustainable economy?" She needs to put some actual facts and numbers behind that BS. She sounds like Hawaii's version of Ocasio-Cortez. I wouldn't vote for her just because she is a DemocRat, and I don't want to hear Party from anyone here, I would vote for anyone that's good for our Country, but never a DemocRat! Congress Member Gabbord's looks could hurt her. Many women won't vote for a woman that is that attractive. And her youthful apperance makes her seem inexperianced. I haven't heard much on her political positions. With 37 Democrats lining up to run 21 months before the 2020 election it is hard to remember individual positions of candidates. Last edited by 17thfabn; 11 Feb 19, 19:04. What's her stand on killing babies? She supports abortion after the 20th week of pregnancy ,she is an other King Herodes . Congress Member Gabbord's looks could hurt her. Many women won't vote for a woman that is that attractive. Then you wouldn't vote 'for anyone that's good for our Country' because you wouldn't vote for a Democrat. But you would vote for a charlatan such as Trump who is not good for the country. Your hypocrisy is noted, as well as your continued choice of party over country. Not a chance I'd vote for her. Pretty much everyone here agreed he sucked , don't you remember ? The Democrats had better be careful. By running so many candidates, many of whom come off as more than a little clownish, they're setting up a situation where one of two things can happen: all of these rainbow and unicorn types blast away at each other over the next 18 months to such a degree that the only one left standing at the end of the primaries is a Trump-esque ignorant loudmouth demagogue, or the Democrats will have so weakened their eventual standard-bearer that the original Trump-esque ignorant loudmouth demagogue wins reelection in Nov '20. Either way we're spoiling for a classic lose-lose scenario. Or half the Dems get so pissed at the how their candidates act, they end up supporting Howard Schultz. Matthew 25:14-30. Jesus tells that it is not sufficient merely to maintain things as they are. Those who await should make good use of the gifts that God has provided them.